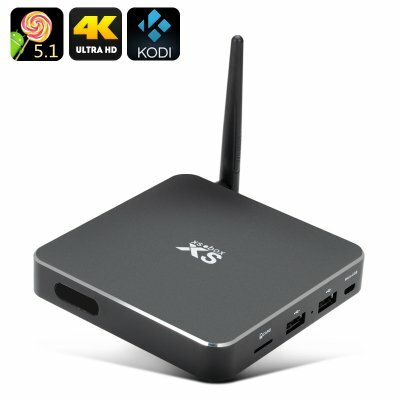 Successfully Added 4K Smart Android TV Box - Octa Core CPU, Kodi 15.2, UHD 4Kx2K Support, Android 5.1, Miracast, Airplay, DLNA to your Shopping Cart. This powerful little TV box is the perfect way to make your TV Smart, its octa core CPU, 1GB or RAM and Android 5.1 OS will bring you a full host of games, movies and home entertainment for the entire family. With 4K – ultra high definition – support, this mini TV box lets you watch all the latest movies and sports events meaning you won't miss out on any of the entertainment. Kodi version 15.2 comes preinstalled so you have a powerful media center ready to go, just add the channels and programs you want from the thousands of options on offer with Kodi and let the fun begin. With Android 5.1 on your TV you can enjoy all and easy to use intuitive user interface with access to millions of apps and games so there's no limits to what your smart TV will be able to do. This quad core android TV box also comes with DLNA, Miracast and Airplay support so you can stream content direct from your phone or tablet. This Android TV Box comes with a 12 months warranty, brought to you by the leader in electronic devices as well as wholesale Android TV boxes..